Approximately 300,000 dogs and cats are bitten by venomous snakes each year in the US, and prevention, protection, and treatment are key. 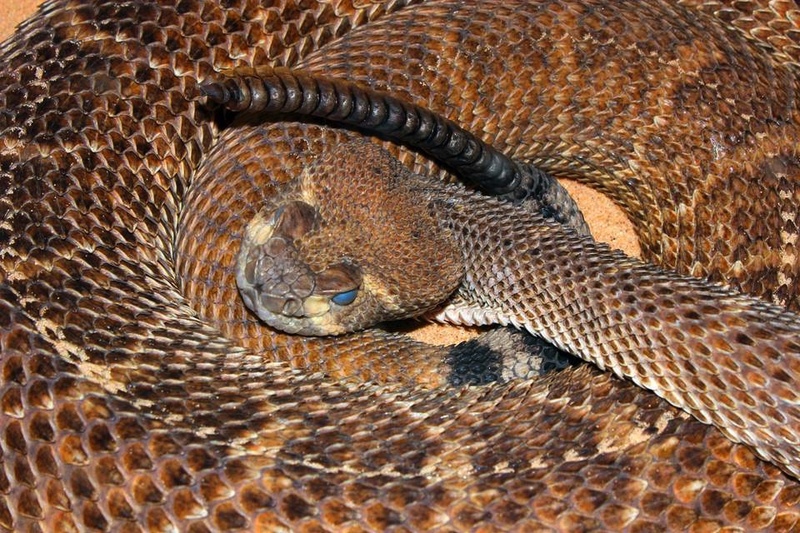 Rattlesnake venom can cause serious injury and even death to pets. Most cases are reported during the warmer seasons, although here in Arizona they are reported and treated year-round. Snake bites are life threatening, extremely painful, expensive to treat, and can cause permanent damage even when the dogs survive, so it’s important to know the facts. November 9, 2018 — Lidl USA is voluntarily recalling specific lots of Orlando brand Grain Free Chicken & Chickpea Superfood Recipe Dog Food because the products may contain elevated levels of Vitamin D.What’s Recalled? Living at Saddlebrooke Ranch can be exceptionally beautiful. Great views of the Catalinas and Mt. Lemmon. A wide range of birds. Beautiful sunrise, sunsets and moon rise. Wonderful clear skies with thousands of stars. However, there are also a few dangers. A particular danger that makes themselves well known, especially as the sun sets, are Coyotes. What to do while walking your dog if you encounter a Coyote? Remember the four basic rules for walking our dogs. It has been brought to our attention that uninformed or misguided residents could unknowingly be contributing to increased risk to their neighbors pets by offering food. This practice is not recommended by state wildlife officials and is illegal in some jurisdictions. According to the Game and Fish Department "It is generally not normal for Coyotes to attack or pursue humans; it is a learned response to human feeding or indifference". To learn more, please click Living With Coyotes. G & C Raw LLC of Versailles, Ohio, is recalling Pat's Cat Turkey Cat Food and Ground Lamb Dog Food because they have the potential to be contaminated with Listeria monocytogenes. Read more C & G Raw Dog and Cat Food Recall. In the past few months, Saddlebrooke Ranch residents have experienced several incidents of missing and lost pets. For those residents who have joined the SBR NextDoor website, please check out several helpful links. Please consider uploading a photograph of your pet to the Pets link. This provides both the pet and owner name. If your pet goes missing, you can refer to the photo. If a resident finds a lost pet, these photos might be helpful to locate the owner. 1. Pets can get dehydrated quickly, so give them plenty of fresh, clean water when it’s hot or humid outdoors. 2. Know the symptoms of overheating in pets, which include excessive panting or difficulty breathing, increased heart and respiratory rate, drooling, mild weakness, stupor or even collapse. 3. Never leave your animals alone in a parked vehicle. Since moving to Arizona, our dogs have been mostly free of flees and ticks. However, depending on where you travel with your dogs, especially if you are an avid hiker, you might want to take precautions. While I don't think ticks are a very high percentage concern in our area, take a few moments to review where on your dog are the likely places they might hide. And hide they often do for long periods if we aren't diligent. A few years ago, we lost our beloved Kodiak. He was 14, so as a 95 pound Rotweiller-Lab mix, we felt blessed he lived so long. What was unexpected was the lengthy seizure that eventually led to his death. Recently I came across a short article from the AKC that might be helpful to other dog owners. Kodiak never suffered any seizure that we were aware of until the night he died. However, it appears dogs to experience minor seizures, sometimes more than one. Blue Ridge Beef is recalling one lot of its BRB Complete raw frozen dog food due to possible contamination with Salmonella and Listeria monocytogenes. Contact: Blue Ridge Beef Dog Food Recall of March 2018. Darwins Natural Pet Products is recalling four lots of its raw dog food because they have tested positive for Salmonella and E. coli 0128, bacteria that can cause serious and sometimes fatal infections. Contact: Carwin's Dog Food Recall of March 2018. J. M. Smucker Co. of Orrvile, OH, is recalling two varieties of its popular Milo's Kitchen dog treats due to elevated levels of beef thyroid hormone. Important warning about Sonoran Desert Toads tangling with our pets. Turn on the garden hose (or other water source) to get a small but steady, gentle flow. Too high a flow can cause your dog to choke or swallow water. Too low a flow (a mere trickle) would be ineffective. Northwest Naturals of Portland, OR, is recalling specific lots of its raw frozen dog food due to possible contamination with Listeria monocytogenes. Carnivore Meat Co. of Green Bay, WI, is recalling 73 cases of its Vital Essentials Freeze-Dried Dog Food due to possible contamination with Salmonella bacteria. TruPet LLC of Milford, OH, is recalling a limited amount of its TruDog Pt Treats due to possible contamination with Salmonella bacteria. Raws for Paws of Minneapolis, MN, is recalling their frozen dog food due to possible contamination with Salmonella bacteria. Smokehouse Pet Products of Sun Valley, CA, is recalling a specific lot of it's "Beefy Munchies" dog treats due to potential contamination with Salmonella bacteria. Redbarn Pet Products of Long Beach, CA, is recalling a specific lot of it's "Redbarn Naturals Bully Sticks" due to potential contamination with salmonella bacteria. 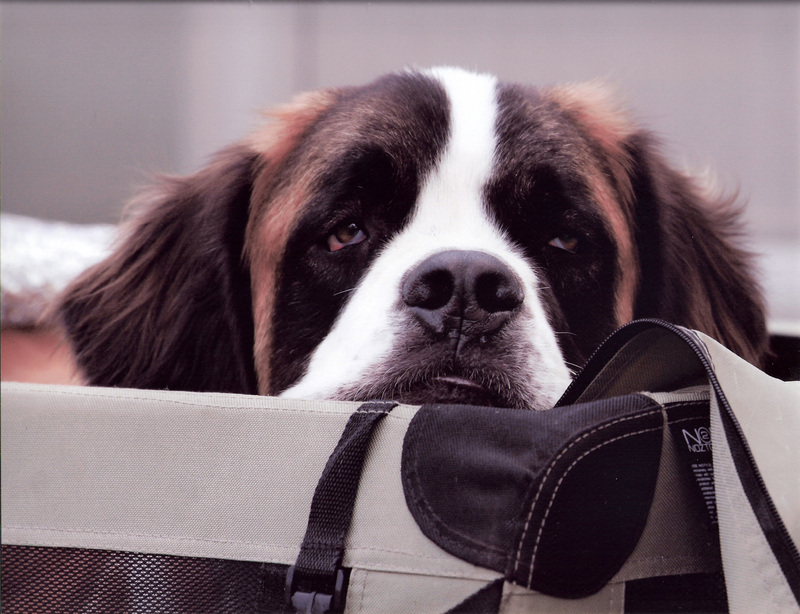 No matter how much a part of our family, our pets - both dogs and cats - aren't always welcome when traveling. Whether you decide to leave you pets with friends, family, or professional pet care services, there are a few basics for consideration in all cases. Is that beautiful landscaping a threat to your pet's health? After we sign all the papers, time to landscape that new property. After meeting with several landscapers, you will pick the plants and hardscape. Soon, you can sit back and enjoy. As you settle in with a favorite drink and fire up the BBQ, the family dog wanders through the foliage, sniffing, possibly digging, maybe even tasting. No harm, right? Dogs do what dogs do best. Residents of Saddlebrooke Ranch are fortunate to have many places to exercise their dogs safely, including a dedicated Dog Park. However, not all pets do well at these parks, and there are other health and safety concerns. While there are many articles providing guidelines, take a few minutes to review WebMD's take: Dog Park Safety: What To Know Before You Go. June 10, 2017 - United Pet Group, a division of Spectrum Brands, Inc., is voluntarily recalling multiple brands of rawhide dog food products due to chemical contamination. If the air temperature is 77 degrees, the asphalt temperature can be 125 degrees. 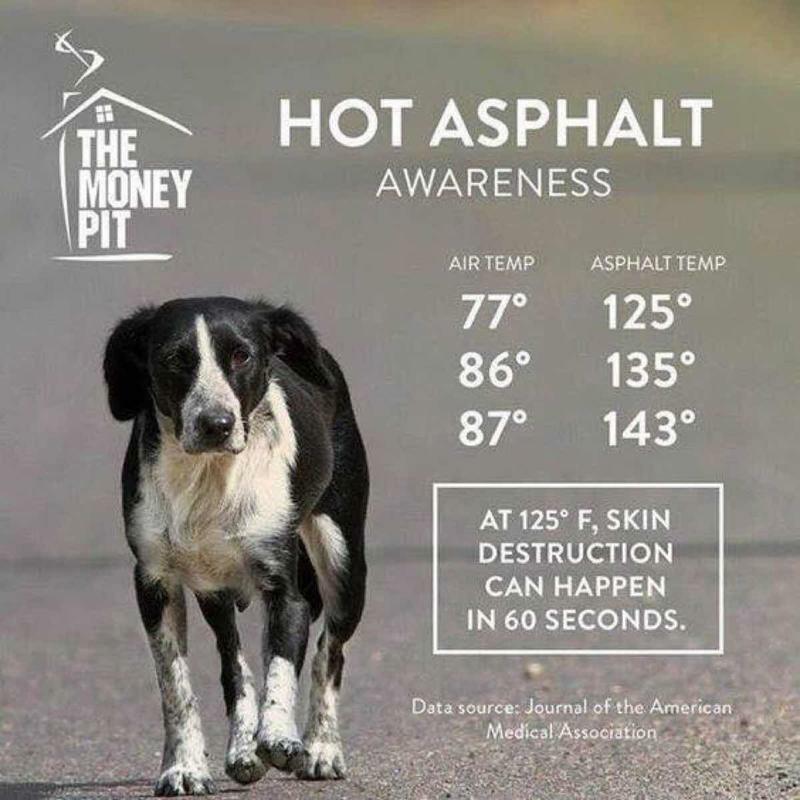 If the air temperature is 87 degrees, the asphalt temperature can be 143 degrees. At 125 degree fahrenheit skin destruction can happen in 60 seconds. April 17, 2017 — Party Animal, Inc. has announced it is recalling specific lots of two varieties of its Cocolicious canned dog foods because they have each tested positive for the euthanasia drug, pentobarbital. Click title for the full article. As a follow up to previous articles about food safety for our pets, here is a reminder for both cats and dogs. The link will take you to an article published at the Pet Helpline. There are four rather common liquids that all dogs owners should keep their dogs away from: Milk, Gatorade, Pool Water, and the water left standing in Ponds & Puddles. 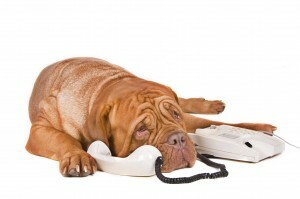 Does your dog lie to you? Check out a short blog at the online version of Discover Magazine. According to a study (ah, the lonely lives of scientists. . . ) dogs aren't just capable of the Guilty Look, they also lie, depending on the situation. If dogs could talk. What would they say to us about how we treat them? For those situations of abuse, its pretty obvious. But what about when with all good intentions we do things our dogs dislike? According to many pet advice websites, there are certain things that humans do (or don't, as the case may be with #4) that annoy, irritate or simply are not good for your pet. Have you ever considered buying a gadget to feed your puppy treats when you aren't home? Or how about another that launches that tennis ball? You know, that ball that after a few throws turns mushy with your Fido's saliva? And how many of us have thought a GPS tied to Fluffy's collar would relieve some of our anxiety, letting us know exactly where she is at any given time. What Human Foods are Dangerous for Our Pets? Let’s face it. Fido sits quietly next to your chair at the table, those soft eyes boring into your heart. His nose twitches in your direction as the smell of salmon, beef or pork tickles the air. What’s a good pet owner to do? I Love Dogs (all dogs matter) website provides items for sale to help keep your dog safe.